The US Embassy in Kathmandu and Nepal Communitere have jointly launched the American Arts Incubator (AAI)—Nepal program on April 5, 2019 with an “artist talk” where American artist Jennifer Berry will talk about her previous work and creative practice, and share with us her approach to the incubator. American Arts Incubator (AAI) is an initiative of the U.S. Department of State’s Bureau of Educational and Cultural Affairs in partnership with ZERO1 that sends U.S. artists abroad to collaborate with local communities for a month-long incubator. The creative collaborations transfer skills in art, technology, and entrepreneurship. Through the digital and new media art workshops, the artists facilitate dialogue and explorations of the social challenge. In Kathmandu, through Berry’s workshops, 17 participants selected through an open call, will learn the basics of digital fabrication and 3D printing to create innovative and participatory projects that engage the public around the theme of opportunity for women. 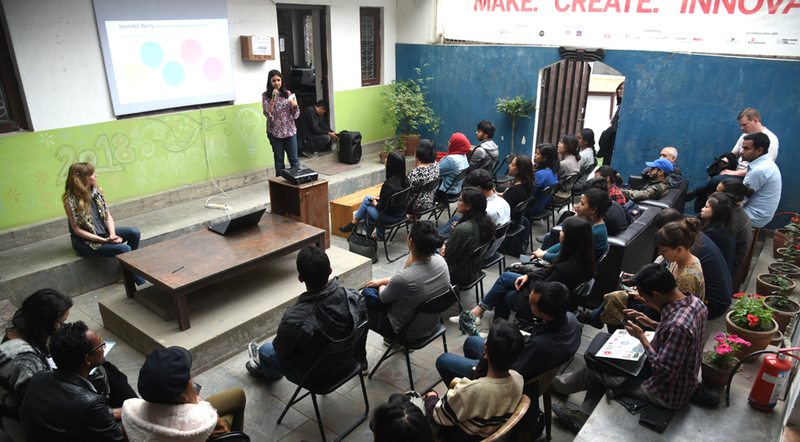 The AAI program will be hosted at Nepal Communitere, a community-based innovation hub that works with diverse change-makers to convert their ideas into reality. The participants can also receive small grants to work on their project ideas. The month-long program will close with a panel review and open house to the public at Nepal Communitere from April 25-27, 2019.